Just when it seems that there cannot possibly be another twist to the Harry Potter tale, Stephen Fry dons his haughtiest and naughtiest tones to bring Harry Potter and the Philosopher's Stone to vibrant life on audio. As Harry battles against the evils thrown in his path, Stephen Fry injects the proceedings with a wry, dry and extremely contagious humour that perfectly suits the tale, wringing out the best in Harry and his cohorts as they get to grips with their new lives at the sharp end of Hogwarts. Fry's innate upper-class drone is perfectly suited to the telling of this most magical tale, cracking into the high-pitched squawking of Hermione the swat, or the gentle tones of the firm but fair Dumbledore, or the evil sniping of slimey Snape at precisely the right moments. I've been wanting to re-read The Harry Potter series for so long but the books are so large. I knew it would take awhile as I'm trying to get through my TBR review pile. I am ashamed to say that I've not read the last 2 books in the series. I know, I must be some kind of traitor to the HP lovers everywhere. It was time. I wanted to read them. What better way than to try the audio book? I've only ever really tried a few audio books. But, let me tell you. The narrator makes ALL the difference. I am so monumentally impressed with this audio book I almost have no words. 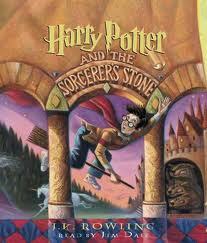 I first read Harry Potter when I was 19 yrs old (1999). Whoa! I remember the first time I saw the book. I was working at Applebee's and serving a mother and son. He was probably 8 yrs old and he had this huge book. I said,"That's quite a big book don't you think?" He said,"It's Harry Potter." I went home thinking, who is Harry Potter? I called my Mom and told her that I'd seen a kid reading a huge book. My Mom said,"It's probably Harry Potter." How did she know?! Well, my mother is a reader. Nothing gets past her. It has been a long time since I've revisited Harry Potter in text. I've enjoyed all the movies. But, I wanted to read the last 2 books and I want to start at the beginning. I'm so enjoying the audio books! I have forgotten how wonderfully these books are written. Pure Brilliance! But let me tell you, the narrator makes all the voices. He does a superb job. It has really changed the stories for me. I'm enjoying them so much more than before. If you've never listened to an audio book, please start with Harry Potter! It's amazing! Hi Mary, I used to read your blog about life in Scotland right while I was on my last book on Harry Potter. Got facinated by Scotland because of HP. BTW what happened to that blog ? I was addicted to it. Anyways, I brought some of those HP books so I can reread them sometimes again. My 9 year old is on her 5th book but would not pick any other book until she said she finishes these. And I am not able to read anything else after HP. Is it just me or is that the magic of Potter ? Fantastic review! I absolutely love Harry Potter (who doesn't?) and I am actually tempted to listen to the audiobooks - just so I can say I have! I'm new to your blog and it's fantastic! - Please visit my latest post & if you haven’t already, enter my International Giveaway! Brilliant review. Harry Potter is amazing - who couldn't love it? Stephen Fry narrates this? Oh I will most certainly be checking this out now! I was very late to the Harry Potter game, but once I discovered it I couldn't put them down. I'm pretty sure I made it through books 1-6 in a matter of weeks, only stopping to go to work. Fantastic review!